When you have a really good cup of coffee, there are a variety of factors coming into play with how it tastes. The temperature of the water when brewing, the coarseness of the grind, how fresh the coffee is, and of course, the roast of the bean. While most of us usually see the bean in its roasted form and only have to grind it to make coffee, it is possible to roast your own beans to your exact specifications. While you can roast green coffee beans in a skillet or the oven, you’ll get faster results from a dedicated machine doing the dirty work for you. 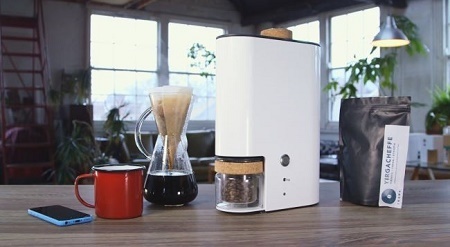 The IKAWA Coffee Roaster is a digital micro roaster which will help you take coffee beans from green to light, dark, or anywhere in between. You’ll be able to select your air flow, temperature, and the duration to get your roast exactly the way you want it. It will take 3-10 minutes for coffee to finish getting to the optimal roast, and the fan will remove the chaff during the process. After it is finished, the beans will be blown into a collection jar where you can either take them out to be ground for immediate brewing, or you can let them cool. The usual practice is to let the beans cool for 4-8 hours to let the gases escape, but it all depends on what your personal taste preferences are. One of these IKAWA roasters is not going to come cheap, as you’ll be looking at $860 or more for this compact roaster. The target audience for this is either those who are loaded and pretentious, or those who see getting the perfect cup of coffee as a hobby.